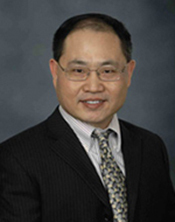 Dr. Jiang is identifying sputum biomarkers that could improve the process of detecting early-stage lung cancer by contributing to development of a non-invasive test that complements low-dose computed tomography (CT) scans and improves the accuracy of diagnosis. Cigarette smoking is a major cause of lung cancer. Finding lung cancer earlier in smokers by using low-dose CT followed by appropriate treatments can save lives. However, low-dose CT always causes overdiagnosis. The overdiagnosis requires additional medical evaluation and has negative consequences such as anxiety, additional medical costs, and other harms to the individuals who don’t have cancer. Therefore, noninvasive methods that can improve CT for accurately finding early lung cancer are urgently needed. To this end, we previously developed a panel of sputum-biomarkers (NBC News and AACR Breaking News) that can improve CT’s performance for lung cancer early detection. Yet these biomarkers are still not efficient for clinical use. Herein, we will use the most advanced technique to develop new and effective biomarkers to improve CT for finding lung cancer at early stages in smokers. Future use of the biomarkers together with CT will enable effective treatments to be immediately initiated for lung cancer, and hence decrease lung cancer deaths. It will also avoid harmful treatments to individuals without cancer and cut the tremendous burden of lung cancer on patients, families, and societies. Therefore, this project will strongly support the mission of LUNGevity Foundation. Screening smokers with CT can detect lung cancer at relatively early stages, and thus reduce mortality. However, CT screening for lung cancer has a poor specificity, often resulting in unnecessary treatments to smokers who have benign diseases. The objective of this proposal is to develop genomic- and non-coding RNA (ncRNA)-based biomarkers in sputum that can complement CT for lung cancer early detection in smokers. Proposed aim 1 is to define sputum ncRNA signatures of early-stage lung cancer using next-generation sequencing (NGS). Proposed aim 2 is to optimize a panel of sputum ncRNA biomarkers with CT for the early detection of lung cancer. Proposed aim 3 is to integrate our previously identified genomic biomarkers and the newly optimized panel of ncRNA biomarkers with CT for the early detection of lung cancer in independent case-control series. Future use of the biomarkers in clinical practice for screening smokers for lung cancer will increase CT’s specificity, and hence reduce harmful and unnecessary treatments to many smokers who have benign diseases. Integrating the biomarkers with CT could assist making decisions for the management of abnormal findings in the lungs and enabling effective treatments to be immediately initiated for lung cancer. The study will translate the strengths of novel ncRNA profiling data developed from NGS into clinical settings by using a simple and cost-effective approach, and thus bridge the gap between basic research and patient care.